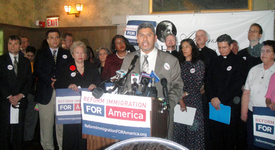 CHICAGO — A broad coalition of Illinois immigrant rights groups, community organizations, elected officials, faith, labor and business leaders launched a Reform Immigration For America national campaign here June 1. Dozens of leaders made the announcement at a mid-day press conference at the historic Jane Addams Hull House at the University of Illinois at Chicago’s campus. The Hull House, led by Jane Addams, was an organizing center and home to immigrant families in the early 1900s. The new national campaign will promote what the leaders call a comprehensive legislative approach to make immigration laws work to serve the needs of American working families. “We are launching this campaign at the site of Jane Addams Hull House, because today we need our leaders to show the same courage and creativity as Jane Addams, our first American woman Nobel Peace Prize winner, in recognizing the contributions of immigrants to our nation and to the state of Illinois,” said Juan Salgado, board president of the Illinois Coalition for Immigrant & Refugee Rights and executive director of the Institute for Latino Progress. “What Americans want across the country, and what we all want here in Illinois is a workable, practical solution that brings working families out of the shadows, that’s fair to everyone, and helps lift our economy out of this crisis,” said Salgado. “The immigration laws are badly in need of repair, and we deserve a system that works and benefits all Americans,” he said. This is a top priority that must be addressed this year, he added. Gustavo Garcia-Siller, auxiliary bishop of the Archdiocese of Chicago and leader of the Catholic Campaign for Immigration Reform, said an interfaith coalition of Catholic, Muslim, evangelical and Jewish groups support the drive. Undocumented workers are often not paid the minimum wage and many work in unsafe conditions, he said. “Yet they cannot stand up for their basic labor rights. Bringing undocumented workers into the system will protect them from exploitation, and all workers will benefit. We call on the Obama administration to follow through with their campaign commitments” on this issue. The news conference here was part of a weeklong series of events, including 37 other local campaign launch press events in 20 states. Leaders from across the country plan to convene at a national summit in Washington June 3-5, bringing together 800 grassroots advocates representing more than 35 states. A national town hall meeting is scheduled on Capitol Hill June 4. Leaders here said a delegation of over 70 will head to the nation’s capital to participate. Those who want to learn more about the campaign and how to get involved are being encouraged to sign up at .